The essential skill on high bar is the swing. Almost every skill on this apparatus consists of a front of backswing. That’s why it’s critical for a gymnast’s future to be able to execute a proper swing. The skill starts at the highest point of the backswing. The gymnast should be in a hollow body position with their head neutral. At the bottom of the swing the gymnast should arch slightly, making a whip. They should then return to the hollow position in the front swing. There are modifications of the tap swing. For example, in a flyaway, the tap should be prior to reaching suspension. If the gymnast needs to accelerate the swing for a giant, the tap may be slightly after the suspension. After the tap the gymnast’s body should continue in hollow until the top of the swing. After this follows the back swing. Until the bottom of the back swing the body should be exactly tight. 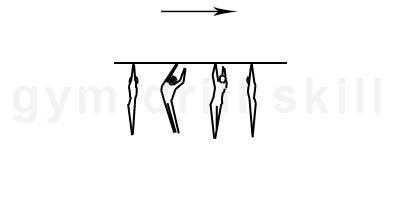 After the suspension, the gymnast begins to hollow and become slightly piked while they shift their wrists. This prevents them from slipping off while regrasping. The back swing finishes at the very top of the move in the hollow position. The starting position is by hanging on the bar with a slight hollow. The gymnast should turn from their toes with their feet together. They should turn around their turning arm. When they finish the half turn, they should grab the bar with their moving arm. They should then regrasp their turning hand from under grip to overgrip. Their head should be in the middle position for the entire skill. Repeat this drill several times. 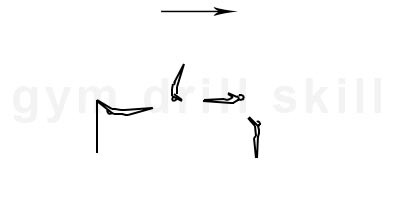 The purpose of this drill is to have the gymnast develop the habit of turning with a hollow body from their toes. The skill begins at the top of the backswing, when the front swing starts. The body is in hollow position. In the bottom of the swing the gymnast provide the tap swing. Ad direct the swing in diagonal to desire turn direction. Leading part of the turn are the toes. The turn starts from the turn in hollow position. The turning arm is tight, the wrist is shifting and provide the pressure against the bar. When the turn is completed, the gymnast regrasp the bar in blocking action in a mixed grip. Turning arm shift from undergrip to overgrip and the gymnast is ready for the next skill in front swing. During the execution, shoulders angle is open.and neutral head position. 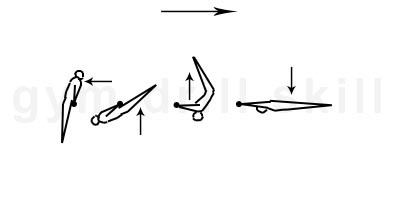 During the all skill, except tap swing, the body of the gymnast is in hollow position. Shifhting the wrist of the turning arm provide the support, which helps block against the bar. Half turn and half turn hops are basic, “profiled” skill, which help to feel the bar and swing better, creates experience and knowledge how to turn in front swing, which is essential for blind change, quast, ginger and etc. The Baby Giant is similar to the second part of a free hip circle. 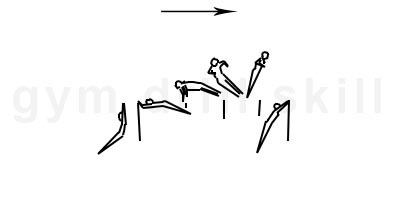 In the front swing, from the lower vertical, the gymnast kicks upward strongly from their legs over and behind the rail. Simultaneously increase the shoulder angle. During the move, shift wrists with tight arms. The body is in a hollow position. The skill finishes in front support, hips do not touch the bar. Eventually, the gymnast continues with undershoot or bail front swing. The front giant begins from an extended handstand. In the downswing, the gymnast pushes back on the rail and keeps the angle of the shoulders open. Create a long swing in the first part of the skill. On the upswing, maintain pressure and extension away from the bar. Shift the wrists and maintain open shoulder angle. Passing through the bottom, the body begins gradually piking in a hollow position until it reaches the upper vertical. Then extend the body position into a handstand. The giant starts from a handstand. The gymnast is in a slight hollow position. Extending their body from the shoulders down to the bottom. At the bottom of the rotation, they should do a tap swing. If the gymnast wants to accelerate the giant, he/she should perform the tap swing from the bottom and afterward. A later tap yields faster acceleration. 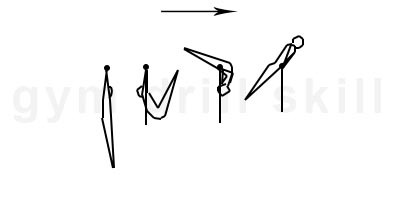 During the execution of a regular giant (after the tap swing), the gymnast continues the upward rotation in a hollow position. Simply said the only place in which there is a change in the position of the body is the lower vertical (during the tap performance). 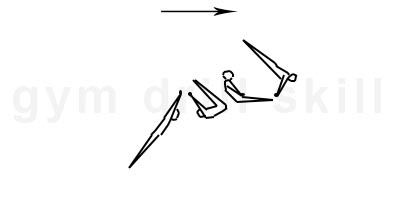 In case of acceleration, after the bottom, the gymnast should cut their shoulder angle slightly and aggressively kick upward with their legs from their feet. The body should be in a hollow to a slightly piked position. The giant finishes in a handstand. The skill starts at the highest point of the backswing. In the front swing the gymnast should perform a tap at the very bottom. After the tap, the gymnast should direct his/her feet to the desired direction. The turn begins with the toes and the hip. 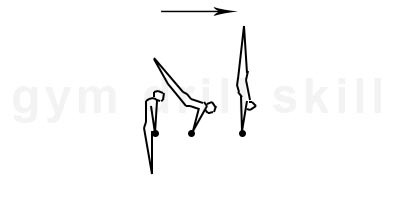 When the gymnast approaches the highest point of the upward swing, they should release their body and finish the 180° turn. Next follows the regrasp of the bar in a hollow position. For all the move, the body is in a hollow position, except during the tap swing. The Chinese tap intends to accelerate the speed of the back giant prior to the dismount. In suspension with their hands, the gymnast pulls the bar and cuts the trajectory of the giant. In the upward swing, they should gradually pike the body until it reaches the maximum point in the higher vertical. The move is very similar to an early toe-on. The piking could be increased more than 90°. In the handstand begins the opposite move. The downswing happens with a push back on the rail and opening of the body for the giant. The tap should be powerful with a strong arch from the hips. The tap should finish earlier, around lower vertical. Next follows an upswing in a strong hollow body position and the dismount. If the initial closing is correct, it naturally gives the exact timing for the following tap. 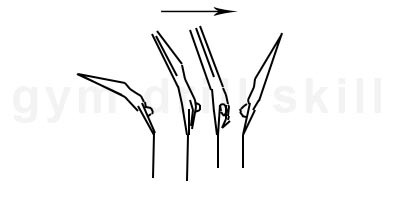 The Hecht tap should begin after the gymnast performs a Stemme and should be completed to above handstand. The higher the better. The body should be fully extended until horizontal on the downswing. During the horizontal position in the downswing, the gymnast’s heels should begin to lead the swing with back pressure exerted against the bar from their hands. This will ensure an arched position which should continue until just prior to the bottom of the swing. At this point, the hips should relax, and the body should quickly snap into a hollow position. The upper back and shoulders should briefly lead the swing before the gymnast releases into a second tight arched position. This secondary heel drive shortens the body and creates a turnover dynamic that will accelerate the body towards above handstand. After improving, the next step is Hecht front giant in immediate succession. A blind change is nearly identical to a half turn to handstand. The difference is that the gymnast passes through handstand and places the free hand in undergrip. The skill begins at the top of the backswing when the front swing starts (or back giant). The body is in a hollow position. In the bottom of the swing, the gymnast provides the tap swing. Direct the swing in a diagonal toward the desired turn direction. The leading part of the turn is the toes. The turning arm is tight, the wrist is shifts and provides the pressure against the bar. When the turn is completed, the gymnast regrasps the bar in an undergrip. The turn starts before handstand and finishes at handstand. During the execution, the shoulder angle should be open and the head in a neutral position. Throughout all of the skill (except the tap), the body of the gymnast is in a hollow position. Shifting the wrist of the turning arm provides the support, which helps block against the bar. The pirouette begins from a front giant. From the lower vertical, in the upswing, the body gradually pikes in a hollow position. The angle of the shoulders is open. The arms are pushing the bar and the wrists should shift for better support. The gymnast moves to the desired direction of the turn. After horizontal in the upswing starts half turn around on the holding arm. The body transitions from hollow to straight during the turn. The turn finishes in a handstand. The head is slightly open and eyes should be watching the rail. The turning arm is tight. It's important to emphasize - the angle of the shoulders should be open, the wrists should shift in order to obtain enough support on the bar, the body should transfer itself in a diagonal direction around the turning arm and the turn should finish early. A back giant one arm is similar to a regular back giant. The skill usually starts from back giant at the handstand position. The gymnast transfers their center of gravity onto the holding arm. At the last quarter of the giant, the gymnast shifts their wrist. When a full rotation is completed, the gymnast places the free hand on the bar. It’s critically important that the gymnast has a strong grip. In order to achieve this goal, the athlete should exercise by squeezing tennis balls or various hand strengtheners. The Tkachev was done for the first time by Alexander Tkachev in 1977. It’s one of the few elements which was invented first scientifically. This skill drastically changed the dynamics of all future high bar routines. 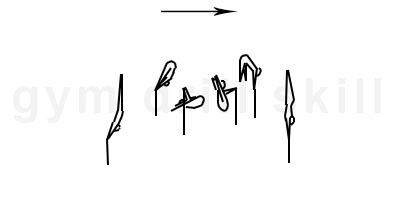 From the Tkachev, many modifications were born - with a straight body, with twists, in connection with other skills, etc. The skill starts from a back giant with a reverse Hecht. An early tap should finish around horizontal in the upswing. After that, the gymnast should push back on the bar strongly. At the same time, they should open their body from their hips. Since the tap is later than normal, the gymnast should push stronger on the bar and stronger with their hips. Doing these will eventually help to release higher over the bar. At the moment of the release, they should open their legs and perform a large half circle sideways as the legs gradually unite. A larger circle with the legs is needed to prevent hitting the rail. During the flight, the body should be arched, but transform into a strong hollow and then piked position. During the tap, the head should be in a middle position, during the flight the chin should be down, and at the moment of the catch, the gymnast should be watching the bar. During the flight, the arms should be passing through the shortest way to reach the bar for catching. When teaching this skill, the coach should emphasize several points. From suspension, the gymnast performs a chin-up. Next, they raise the legs over the bar and place their hips onto the rail. Legs continue to rotate down, the gymnast shifts their wrists, and raises their body until they reach support. At the last part of the skill, the arms should get tight. Essential skills for the pullover are chin-ups, leg-lifts, and shifting of the wrists. In the support position, the gymnast compresses their body into a maximum piked position. Lift the legs up, and lean the shoulder at the same time. Arms are tight. Then follows a strong back swing upward. The body is straight and slightly arched. Legs and arms are tight, the head is in the middle position. The gymnast pushes back on the bar and cleans their shoulder angle. The skill finishes in a handstand. The undershoot is similar to the first part of a back hip circle. The gymnast should begin in front support. They should kick back with a strong cast. When their hips return to the bar, they should lean back and reach a candlestick position in the front. They should push the back backwards with their arms, opening their shoulders and executing a back-swing. This skill should be performed with a straight or hollow body, and tight elbows. The gymnast should begin in front support. They should kick back with a regular cast with their hips away from the bar. When their hips return to the bar, they should lean back with their shoulders, creating speed to execute a circle around the bar. The body should be in a hollow position, with their hips turning around the bar. Their elbows should be tight, and their buttocks squeezed. As they execute the skill they should shift their wrists around the bar as they rotate. They should finish the skill in front support. The entire skill should be performed with a neutral head position. The gymnast should begin in front support. They should kick back through a regular cast, with their hips away from the bar. The cast should be around and over horizontal. Their body should be in an exactly straight position. Their arms should be straight and their head in the middle position. Before their hips return to the bar, they should lean back with their shoulders, creating speed to execute a circle around the bar. The scope of the early drop is to create as much distance between the hands and the hips as possible. The body should be in a hollow position, with the hips turning around the bar. The gymnast’s elbows should be tight, and their buttocks squeezed. 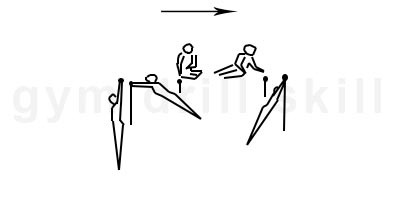 When the gymnast reaches the candlestick position, they should start pushing back the bar with an opened shoulder angle. As they execute the skill they should shift their wrists around the bar as they rotate. At the last quarter of the circle, they should shift their wrists again, keeping their arms tight in order to reach the support position. They should finish the skill in front support. The entire skill should be performed with a neutral head position. As the circle becomes more refined, the athlete will be able to open the shoulders earlier and more forcefully at the completion of the shoulder circle. This will eventually develop into the free hip to handstand, in which the gymnast should direct their body to vertical from their feet and push back stronger on the bar. The kip is a basic skill. It’s two main uses are to start a routine and to connect skills. The kip allows the gymnast to go from a swing under the bar to support on top of the bar. The skill starts from standing or from a front swing. 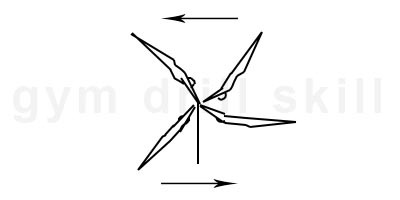 The up swing should finish around 45 degrees under horizontal. The body is completely extended. The gymnast lifts his/her legs towards the rail. The move continues backward in a piked position, the toes should touch or be very close to the bar. In the up swing the body gradually transforms from a piked position to a hollow. The gymnast pushes the bar towards the hips with tight arms. Legs are following the rail from the toes to the hips. Before reaching support, the gymnast shifts her/his wrists and lean shoulders forward. The skill finishes in support. The endo is a very technical skill. The gymnast should be well stretched, strong, and he/she should be comfortable with their swing. It begins from handstand in undergrip. The body is slightly arched behind the handstand. It’s recommended to start piking a little bit later than handstand. In the rotation forward, the body is piked from the hips. The angle of the shoulders is open, first 90 degrees until horizontal. The arms pushing back on the bar. Then the shoulder angle increases, with the body continuing to compress. The gymnast should pass through the bottom vertical in a compressed piked pancake. In the upswing, until the gymnast reaches the horizontal, they should push the bar backward in order to clean the angle of the shoulders. An important move at that stage is the shifting of the wrists. At the same time, the body continues compressing in a piked straddle. The gymnast reaches the upper vertical compressed with extended shoulders and arms in vertical. Next follows an opening of the body up to handstand. The coach should emphasize on the long swing rotation in the first part, compressing the body at the second part, shifting the wrists and correct execution of the press to handstand in the third part. This skill begins from a back giant. 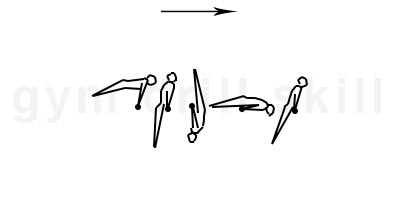 In the lower vertical position, the gymnast starts piking from the hips and the back, at the same time the shoulder angle should be extended. Around the upper vertical position, the gymnast should place the soles of their feet onto the bar. There are two modifications of this skill, one with the legs together and one with the legs in a straddle. When performing in a straddle, the athlete should place their feet close to their hands in a shorter straddle. The whip of the legs should be aggressive enough to ensure acceleration for the successive sole circle. Before finishing the circle in the upper vertical position, the gymnast should start pressing to a handstand. The toe-on toe-off is essential for Japanese Tap and Stalder. For an Adler/Jam/Stoop there are two main techniques for the first part of the skill. The first option is to start the dorsal circle from a handstand. 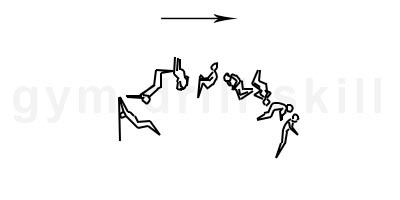 The gymnasts finish their giant swing forwards and after they reached the upper vertical line (handstand with extended shoulders), they stoop in. For the second technique, the gymnasts do not finish their giant swing. 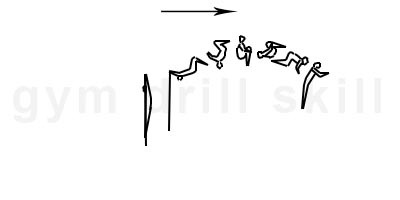 Shortly after they pass the horizontal line on the high bar they bend their hip angle for the stoop in. The gymnasts pike their body to their maximum, placing their feet between their hands. 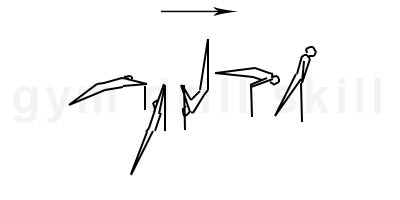 For the first 90 degrees, the gymnasts should keep their shoulder angle open. From the lower vertical they should begin to raise their hips and open the shoulder angle. At the handstand, the athletes should shift their shoulders into an L-grip, and raise their legs until their body is completely extended. Layout flyaway can be made from a front swing or a back giant. In the downswing near the lower vertical position, the gymnast should execute a tap. The difference between a regular tap and a dismount tap is the timing. A tap dismount is performed earlier. After the tap, the body should be in a hollow position. It’s extremely important for the shoulder angle to be open and the head in a neutral position. This should eliminate the risk of performing the flyaway closer to the bar. Usually, the release is performed during the upswing when the body reaches horizontal or slightly above. During the flight, the body continues to rotate in a hollow position. Before landing, the gymnast should extend to a stretched position. Emphasize on the tap. The position of the tap should define the release. If the tap is performed early (before the lower vertical) then it usually means that the release will be performed upward and forward. If the tap is regular (at the bottom) then it’s going to be extremely dangerous because the release will be performed predominantly upward and close to the bar. One more very important topic - in the upward swing, the body should be in a hollow position with the shoulders and arms fully extended with the head in the middle position. 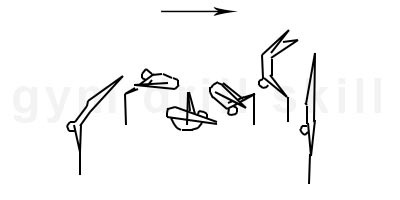 The tuck open double flyaway is a continuation of the evolving tapping and lifting actions described in the layout flyaway section while adding the initiation of the rotation to a double salto. 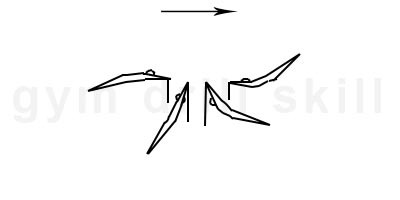 The giant swings leading to the dismount should encourage an increasingly powerful tapping action to bend the bar downward significantly in the hanging phase. A sharp kicking action through the vertical release point on the upward swing should occur as the bar rebounds upward. 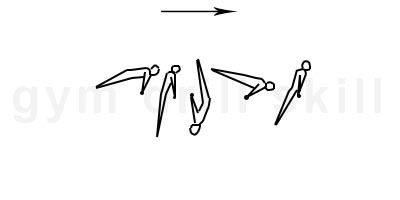 With correct timing of these actions, an accelerated rotation and vertical lift allows the gymnast to open quickly to a straight position at the peak of the double flyaway. The gymnast may perform the tuck with their hands on or off their knees. 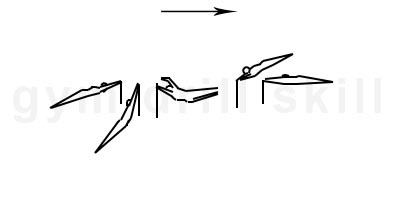 Opening to a straight position will stop the rotation of the flip and allow the gymnast to prepare for a controlled landing on the descent. 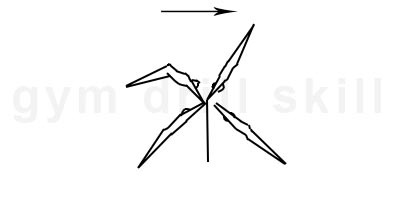 The double layout flyaway utilizes the same lead-ups described above. On release, the body shape is hollow and the shoulders stay down with the head neutral. 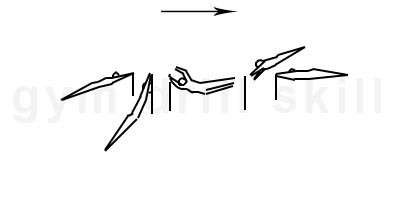 As the body rotates the first ¼ - ½ of the flip, the athlete has the option to maintain a hollow position or stretch to a tight arch for the remaining rotations to complete the skill and prepare for landing. Integral part of gymnastics coaching process are skill drills. They help gymnasts to learn easier and technically correct. With GYM DRILL PRO you will find variety of ideas for the most the basic gymnastics skills. 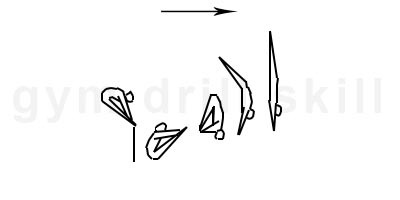 There are plenty of images with skill drill progressions. It is intended to support explicitly the qualified coaches in their daily coaching business. DO NOT practice without the guidance of proper professionals.